So it was a pretty cool sesh, going back and forth and hitting the occasional mini ramp. The wind died at about 5 PM, I was home by 7. Tomorrow the forecast is showing colors that I've never seen in my life. 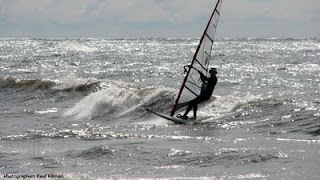 The guys from www.windsurfillinois.com are going out, I don't know where, chak out the site by the end of the week for pictures of the massacre!!! Last weekend there was some wind forecasted for both days... time for a road trip. 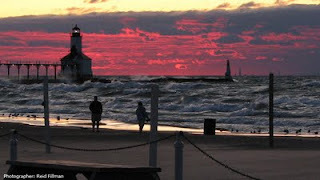 Our first stop was Michigan City, in Indiana. 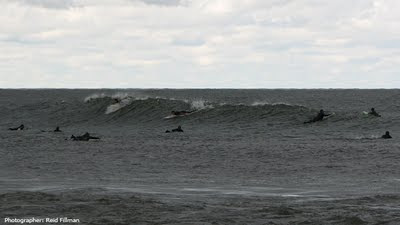 The beach faces WNW, and the forecasted wind direction was NNW,so we were expecting some nice side-on push... Nothing happened until 6 PM, when all of the sudden it sarted blowing in the 18-20s. It was pretty on-shore, so I rigged my 6.5 to have extra power to make it upwind, and get out of the impact zone that was getting pretty big. The ride out felt great, I went through the white water with no problem. 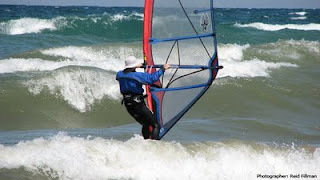 My ride back was a memorable one: I was running parallel to the beach riding walls of fresh water. 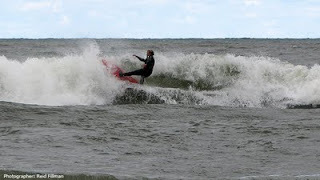 In one of those waves I wiped out, and just made it in time to grab my rig before the next wave hit. This second wave fell with all its force on my sail, and snapped my mast in half, the sail made it in one piece though, GO EZZY!!! Anyway, that was the end of another great short sesh... time for a beer. Sunday we went ot St Joseph, in Michigan. This is a surf spot, pretty cool, and famous in the area for getting scary big... Well, it didn't get stary big, but it definitely showed up its potential. 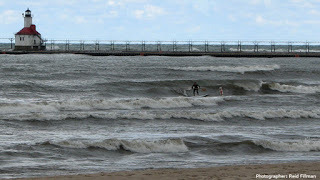 The waves looked so nice in the morning that we decided to try SUP. My first time on a SUP, and I must tell it's a great woukout!